Easy to use, simple to maintain and incredibly powerful, neatly into any work environment. iWeld Professional Laser Welding System is the highest peak powered laser welding machine in its class. This machine welds SILVER along with other complex alloys. The iWeld Professional with Removable Welding Chamber is ideal for a wide range of metal joining and repair applications. 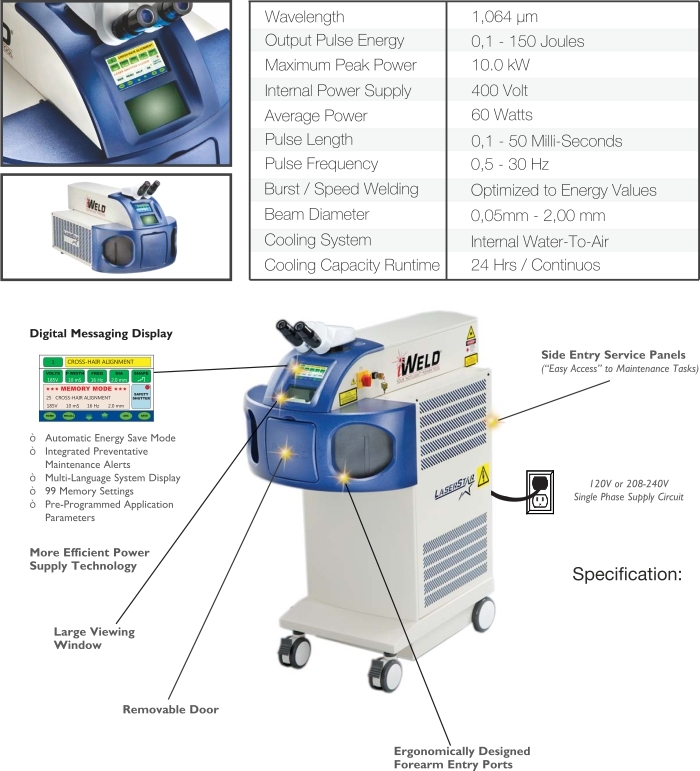 The system’s compact, portable, space-saving design, coupled with LaserStar’s well-known reputation for high quality, efficient laser sources, make the iWeld Professional Laser Welder an excellent value. Operators benefit from pin-point accuracy, increase the range of assembly and repair applications, and minimize the potential hazards of heat damage. The resulting weld is considerably stronger than a traditional solder joint. The comfortable, ergonomic design, with conveniently located operator controls and display, ensure optimal utilization with minimal operator fatigue.